Summary: As she did for the Presidents in Rutherford B., Who Was He?, Marilyn Singer has written a poem for every First Lady from Martha Washington (“‘Lady Presidentess,’ dear wife of our first leader,/did not bemoan, she set the tone,/for all who would succeed her”) to Melania Trump (“She learned languages, changed her name,/married into fortune, embraced new fame”). Each is accompanied by a picture of the First Lady in some scene from her term. Includes a page on “Being the First Lady”, several pages of thumbnail portraits and brief profiles of each woman, and a list of sources for additional information. 56 pages; grades 2-5. 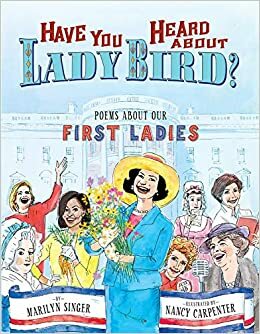 Pros: These easily accessible poems are a fun way to introduce kids to the wide variety of women who have served as First Lady, and the way the job has changed over time. Cons: Some of the poems about the less well-known First Ladies may be a little confusing to kids without any background knowledge.